Susie Oberdahlhoff is getting settled into her new role as Pike County Clerk and the appointment was made official on Monday, Jan. 28 by Gov. Michael Parson . She was appointed to the office originally by a unanimous vote of the Pike County Commissioners after Missy Jaeger announced she would not take office after winning the election. The appointment by commissioners was temporary until the governor made it official. She will serve in this capacity for the next two years until the next general election at which time the unexpired remainder of the term will go to voters. Oberdahlhoff noted that she is excited for the challenges ahead and is proud of what has already been accomplished since she was sworn in at the beginning of the year. She added that she wouldn’t have agreed to assume the seat if she was prepared to put her whole self into it. “When I left my last job it was to be a full-time grandma,” she joked, adding that as great as that was, she also missed being around people in a work situation. Oberdahlhoff said the staff and courthouse officials have been very supportive since she started. She added that she is also trying to keep staff motivated as well. “Our motto is ‘do better than your best,’” she remarked. Oberdahlhoff said she doesn’t just plan to fill the seat but will be taking an active role. Most recently, she completed work on the budget with commissioners. The budget looks strong and she completed the budget message on Monday. She noted that her past work experience has been beneficial as she learns more about the office. Oberdahlhoff started her work career in the clerk’s office when she was in high school so she was able to hit the ground running in many ways. She has also served as an election judge over the years and has been interested in politics in general. While she is a Republican, she has worked with both political parties and noted that to a large degree serving this office has nothing to do with personal politics. “I’m here to serve everyone and that’s how it has to be for the office and everything to be successful,” she remarked. Oberdahlhoff moved to Bowling Green when she was in sixth grade. She is a member of the Class of 1962 and attended William Jewell College. 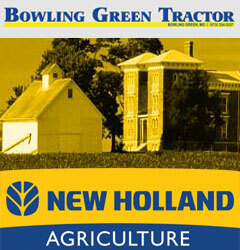 She and her husband, Richard, have lived on the family farm outside of town for many years. She worked in the clerk’s office until she had her first child. From that point she has served the Missouri Beef Council as a consumer relations coordinator and traveled the state. She was also the director of promotion and education for the Missouri Soybean Board. After many years working in marketing at a public relations firm, she decided to take on retirement and being a full-time grandmother. She joked that coming back to work will mean Richard can buy more livestock. She added that money wasn’t the driving force, but that a desire to serve was the main factor in agreeing to take on the office. This is evident in the number of volunteer efforts she has had over the years locally and at the state level. Oberdahlhoff noted that keeping the office running despite how busy this time of year is was key in this transition period. 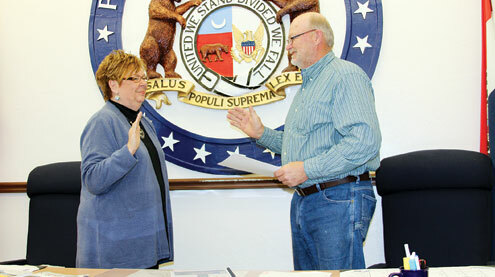 Oberdahlhoff was sworn into office again on Monday by Presiding Commissioner Chris Gamm. All three commissioners said the transition has been hugely positive and look forward to working with Oberdahlhoff and her office over the next couple of years.